Why Choose Wyoming for Online Higher Education? The Wyoming Department of Workforce Services projects that Wyoming job seekers can anticipate 15.6% of the state’s new jobs to require a bachelor’s, 1.9% a master’s, and 2.3% a doctorate from 2016-2026. These modest projections reflect a nationwide shift toward favoring more educated, specialized workers. Staying competitive in the workforce often involves additional training and education. Many workers stay ahead of the curve by returning to school via online programs. These online programs come in a format highly accessible to working professionals. Wyoming offers several accredited online programs that warrant interest from both in-state and out-of-state learners. Laramie’s University of Wyoming (UW) and several community colleges, including Casper College, feature online degrees from the certificate to the doctoral level. These opportunities attract both in-state and out-of-state students, including more than 500 graduate students enrolled online. These affordable, accredited, flexible programs tailor to working professionals, single parents, and minority groups such as Native Americans. Those with jobs in fading labor industries can explore these programs to transition towards a better future. Many factors affect tuition cost. Four-year institutions cost more than two-year schools. Public schools often offer a reduced tuition rate for in-state students in their on-campus programs. Some schools, including UW, only offer a tuition break for students residing on campus and charge in-state and out-of-students the same rate. These residency-related tuition rate distinctions generally apply to distance learners, too. Some schools may require you to verify a year of in-state residency and intent to remain in-state by asking for pay stubs or a new driver’s license. Reciprocity agreements with surrounding states can also reduce your degree cost. Tuition at Wyoming’s postsecondary schools compares favorably with national averages. The state offers the nation’s cheapest average annual out-of-state tuition at $12,770, almost half the national average of $24,354. Many schools charge lower tuition rates for online course credits. Others, such as UW, charge a flat per-credit rate for both online and on-campus learners. UW and the several two-year colleges that offer online programs in Wyoming boast some of the nation’s most affordable tuition rates. Students considering out-of-state online classes should consider several factors. For starters, most online students at Wyoming programs pursue undergraduate degrees. Also, many Wyoming schools charge the same tuition rate for on-campus classes as online classes. However, Wyoming exists as part of the Western Undergraduate Exchange (WUE) reciprocity agreement, which offers reduced tuition for residents of surrounding states. WUE also awards scholarships for undergraduates with certain conditions, such as maintaining a certain GPA and full-time enrollment. Students in surrounding states interested in attending college in Wyoming can access tuition breaks through the Western Interstate Commission for Higher Education (WICHE), the regional interstate compact to which it belongs. The discounted tuition program that operates through the compact, WUE, helps students from western states belonging to WICHE access discounted tuition and scholarships. From 2017-2018, Wyoming residents saved $8.9 million out of the $365.4 million total saved by students in western states through WUE. The opportunity to access these savings benefits the western states in unexpected ways, often incentivizing out-of-state students to remain in Wyoming after graduation. For states belonging to WICHE, the WICHE State Authorization Reciprocity Agreement (W-SARA) ensures consistency of educational standards and protection against oversight. It also makes it easier for out-of-state students to take online courses at out-of-state institutions within the compact. This state authorization agreement makes it easy to discern whether your online credits can transfer to a school from another western state. Institutions voluntarily decide on W-SARA membership, so ask admissions whether your chosen school belongs to W-SARA. Tuition rates remain program- and institution-based. Ask your prospective program about what rates apply to you specifically as a potential member of a specific program. The following rankings draw upon a smaller pool of institutions with online colleges, as at present Wyoming contains only 11 colleges and universities. This list only includes accredited institutions that offer cheap online degrees at the best value. Whether you ultimately pursue a graduate degree at UW or an associate at Laramie County Community College, use this list to weigh factors such as financial aid and awarding credit for experience. 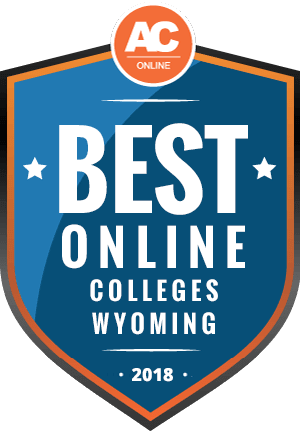 Our Best Online Colleges in Wyoming rankings are backed by data collected and analyzed from The Integrated Postsecondary Education Data System, a program managed by the National Center for Education Statistics. Surveying over 7,500 colleges annually, it is among the most longstanding and trusted providers of U.S. postsecondary information. If you want to learn more about Wyoming’s online schools, see the FAQ below. If you have specific questions, contact an admissions officer. Do Online Credits Cost More or Less in Wyoming? Wyoming offers some of the nation’s lowest tuition rates. Cheap tuition rates do not reflect a lower standard of education, as UW holds regional accreditation. These schools cater to underserved populations on a tighter budget, often individuals who are reentering school after years in the workforce. Wyoming’s online programs emphasize accessibility and practicality, whether at the associate or doctoral level. UW’s Commission on Collegiate Nursing Education-accredited DNP nursing program, for example, boasts one of the nation’s lowest per-credit rates for the degree at $406. SNHU charges $627 per graduate credit hour. Which Wyoming Schools Accept the Most Transfer Credits? Wyoming’s transfer policy emphasizes accessibility. UW, for instance, features relatively lax standards for transferring credits. The school specifies that credits earned at any of the state’s public community colleges transfer to UW. In fact, Western Wyoming Community College explains that associate degree holders can transfer all of their credits towards an undergraduate degree at UW. Nevertheless, UW requires students to earn a minimum of 30 credits through their school in order to earn a bachelor’s, 30 credits for a masters, and 72 credits for a doctorate. Applicants should remember that UW generally only acknowledges credit from regionally accredited institutions. Reciprocity agreements with surrounding states in WICHE make it more likely that credits earned in western states transfer to UW. Students interested in attending UW can use the school’s transfer catalog to determine which credits from their previous schooling might transfer to UW. If the school cannot find a direct match for a course taken at another regionally accredited institution, then the school awards general or elective credits. The school reviews study-abroad credit on an individual basis. UW also allows students to transfer credits from some military schools. Will Any Online Colleges in Wyoming Accept a GED? All online colleges at the undergraduate level in Wyoming accept a GED in lieu of a high school diploma. The GED test entails a $120 testing fee and features four sections, testing mathematics, science, social studies, and reasoning through language arts. In order to gain admission to UW, you must have an average GED test score of 550 or greater, with no score lower than 500 on any individual section. GED holders must be 18 years or older. Those under 21 must also submit ACT or SAT scores. Many of Wyoming’s schools offer assistance to GED test takers. For instance, candidates can take their­­ GED test after preparing via free high school equivalency classes at Casper College’s adult learner center or at Sheridan College. You can also take your GED test online. How Many Academic Terms Per Year Do Online Colleges in Wyoming Offer? None of Wyoming’s online colleges start outside of a typical semester schedule. Online courses usually follow a self-paced, asynchronous format that tailors to full-time workers. This flexibility allows students to pursue a part- or full-time course load. They can also complete essay, group discussion, and exam assignments via online learning management systems such as Moodle at Northwest College and Casper College, Canvas at Western Wyoming College, and Brightspace at Laramie County Community College, at their leisure. In contrast, UW of­fers an accelerated-pace online bachelor’s in nursing that takes 15 months to complete. Accelerated degrees operate under a similar principle as online courses that start independently from a semester or quarter system, because they serve the needs of nontraditional learners with limited timelines for additional education and training. These individuals may need to begin their degree immediately for professional or practical reasons. An accelerated degree jumpstarts a career in a shorter timeframe than a conventional degree. Schools that do not follow semester or quarter schedules and instead allow courses to start monthly or weekly do so to allow students greater flexibility. These programs may feature smaller class numbers and ultimately give students a more individualized educational experience. Which Online Colleges Will Accept FAFSA in Wyoming? You must first complete the FAFSA form before applying for financial aid. The information gleaned from your FAFSA gives the school an idea of how much financial aid you need. The office of federal student aid uses the provided information and your parents’ financial status to calculate your expected family contribution. The school then subtracts this rough number from the cost of attending your chosen school. Completing your FAFSA allows you to discover your eligibility to win a financial award, such as a Pell Grant. Completing the FAFSA form also preludes any scholarships you might receive. Many scholarships available at UW specifically cater to first-year students and transfers. As a first-year student, completing your FAFSA as soon as possible should take top priority. Are There Any Free Online Classes I Can Take from Wyoming Colleges? No Wyoming colleges offer free online courses per se; however, Laramie County Community College recently debuted a scholarship called Rediscover LCCC that allows nontraditional learners to attend free classes for up to two years. Rediscover LCCC scholarship recipients can complete their associate degree or certificate in an online format. Candidates must be 25 years old, a first-time student with no previous degrees, and Wyoming residents for at least three years. You must complete your FAFSA form for consideration for Rediscover LCCC. The program also requires candidates to attend a program in a high-demand field such as information technology, healthcare, and business, and maintain a minimum 2.5 GPA. These Rediscover programs allow for either directly transitioning into a career upon graduation or transferring to a four-year university. Regularly meeting with your adviser and participating in career development activities can simplify the transition. UW students can also take courses without seeking a degree; however, non-degree students cannot receive financial aid or scholarships. International students or those with suspended status from UW or any other college or university cannot get non-degree status at UW. How Can I Find the Online Program Options at Wyoming’s Colleges? Students in Wyoming can use the Wyclass search engine, offered by the Wyoming Distance Education Consortium, to find and request registration for online classes within the state. The search engine allows students to refine results for school, department, and delivery method. Delivery details let you see whether the course follows a synchronous or asynchronous format, and whether the class uses special tools such as teleconferencing or interactive televisions only available at a specific site. Students should not treat registration requests made through Wyclass as guarantees of registration for desired classes. After requesting registration, the school contacts students directly to let them know the status of the request based on availability. In 2010, the service won a first-place award for innovative tools in online education from the Center of Transforming Student Services, an auditing service for western colleges in the WICHE compact based in Minnesota. Students should complete their FAFSA form as early as possible as it opens the door to vital resources such as Pell Grants. Since students do not have to repay grants, they should consider grants their first and best bet for financial aid. Consider also the range of scholarships available specifically to Wyoming students. Private organizations offer many that tailor to students of diverse racial and ethnic backgrounds in Wyoming. Korean heritage students from high school senior to graduate studies residing in Wyoming may apply for this award. Applicants must present a minimum 3.0 GPA and demonstrate financial need. Both U.S. citizens and foreign nationals may apply. The American Society of Mechanical Engineers (ASME) offers a $3,000 award to a single public school undergraduate or graduate student in southwest states from ASME District E studying mechanical engineering-related majors. Applicants must present a minimum 3.0 GPA and remain in good standing as ASME student members. The Hathaway Scholarship awards Wyoming resident high school students based on both merit and need to incentivize their pursuit of post-secondary education. Students must take two years of a foreign language, then two years of either a foreign language, fine arts, or vocational classes for eligibility. Applicants applying on the basis of need must complete their FAFSA. First-generation American students residing in Wyoming between the ages of 18-22 may apply for this scholarship to attend either UW or any of Wyoming’s community colleges. Applications for the single award of $500 close in April. Recipients must partially use the award on educational expenses in the school year following the application. Wyoming resident college juniors to graduate students interested in an occupational safety-related major may apply for this scholarship offered by the American Society of Safety Professionals (ASSP). The ASSP only awards scholarships to ASSP members, so non-members must join along with submitting their application.